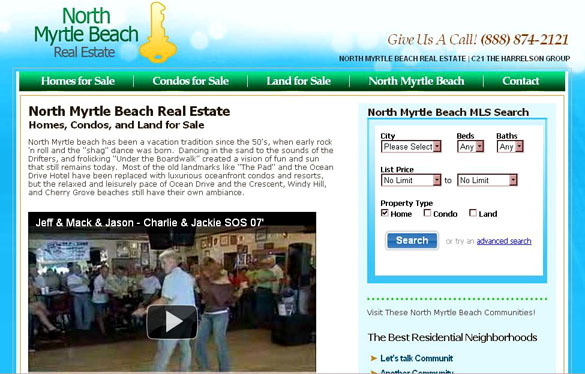 We've got a new website for North Myrtle Beach Real Estate! If you're looking for a condo in Myrtle Beach or North Myrtle, you can find enough webpages and information on each one to pave Highway 17 the whole 60 miles of the Grand Strand. But what if you're looking for a HOME IN NORTH MYRTLE BEACH??? Almost no real estate site has information and photos about the different housing developments that are everywhere in both beaches...but particularly in North Myrtle Beach. If you don't know the name of any of the developments, you can't even search the MLS to look for what's available! Well, now you can. We've got about a dozen of the single housing communities with photos and info, and will be adding to it as we can. We're also building out the C21 site for the south end now too! So visit our North Myrtle Beach real estate site and let us know what you think. Tell us if you'd like a particular neighborhood added. We want to be your Number One source for real estate in the Grand Strand, and we are doing this by putting knowledge and information at your fingertips. Tell us what else you'd like to see! You can contact us through our C21 Myrtle Beach site, or through the NMB site!